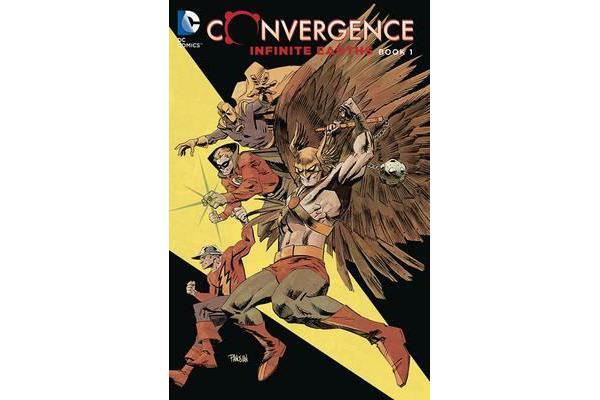 Starring the characters from CRISIS ON INFINITE EARTHS, this CONVERGENCE tie-in title features heroes and villains from the 1970s and 1980s, as they fight amongst one another for alternate Earth supremacy! Legendary creators Len Wein, Jerry Ordway, Paul Levitz and Paul Levitz team with some of the best artists in the industry to tell the continued tales of some of the greatest series of all time, including INFINITY INC, JUSTICE SOCIETY OF AMERICA and WORLD’S FINEST COMICS, as well as stories from the worlds of ACTION COMICS and DETECTIVE COMICS. Collects CONVERGENCE- JUSTICE SOCIETY OF AMERICA #1-2, CONVERGENCE- INFINITY INC. #1-2, CONVERGENCE- DETECTIVE COMICS #1-2, CONVERGENCE- WORLD’S FINEST COMICS #1-2 and CONVERGENCE- ACTION COMICS #1-2.